Aged in four different hand-selected casks: ex-bourbon barrels, quarter casks, virgin American oak barrels and European oak hogsheads. Vigilance and craftsmanship hold the key to this complex Islay malt. No one knows the full history of Laphroaig as much of it has been lost in the midst of time unfortunately. For a long time on Islay as in all Scotland, distilling was illegal so no one spoke of the numerous small stills, easy to move around and usually hidden in farms. If you wished a refill, just a nod and a wink in the right direction! We know that the Johnston’s established a farm in Laphroaig around 1800 as, a while after, Charles & Willie Doig were asked to work “at the distillery”. From 1815, the Laphroaig reputation grew and caught the attention of tax agents who established “officially” Johnston & Johnston. This is how the great Laphroaig adventure began. It is said a good story is about a good story-teller and who better than one of the former distillery managers? Discover the notes a visitor took after his interview with Iain Hendernson, retired in 1999. 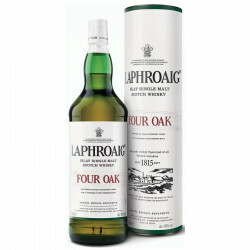 You may also check the complete history of the last two hundred years of the Laphroaig chronology. A triple maturation that brings the aromatic balance between peat, oak and Sherry to the utmost. 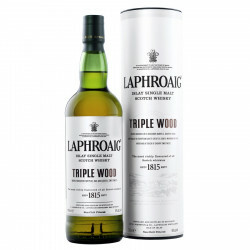 Nose: aromas of peat smoke with stewed fruit and warm, toasted vanilla. Palate: hints of sandalwood, pine, fir and willow. Oak embers and seaweed with smooth butter cream. Finish: salted liquorice and peaty.